The AC-130 flying gunship fleet is one of the most fabled and feared assets in the entire USAF inventory. Known for its ability to unleash a broadside of cannon fire in the dead of night, the newest of the AC-130 lot is more about smart bombs than raining lead and howitzer shells down on the enemy. Before the turn of the decade it became clear that the aging AC-130 fleet was in low supply and exceedingly high demand. As a result the Air Force Special Operations Command decided that it should augment the existing fleet on AC-130H and AC-130Us in the short term, as well as replace a portion of them in the long term. The outcome of this decision was to outfit a portion of the MC-130W Dragon Speer special operations Hercules aircraft with a semi-modular kit called the Precision Strike Packages (PSP), similar to but more elaborate than the Marine's Harvest Hawk kit, which would give these Hercules the ability to perform Close Air Support (CAS), ISTAR (Information, Surveillance, Target Acquisition and Reconnaissance), armed over-watch and support Special Forces missions without having to buy an entirely new aircraft. In the longer term the AC-130J, based entirely on the newer and much improved Super Hercules platform, would replace older AC-130Hs that had reached the end of their service lives. It only took about a year and half to take the AC-130W, dubbed the "Stinger II," concept and turn it into reality. What resulted from this initiative was more of a flying arsenal and sensor ship than a traditional gunship. The idea was to create a gunship with minimal airframe alterations and to provide an indirect precision attack capability to the AC-130 family. A single Bushmaster 30mm cannon was fitted to the forward port side of the aircraft's fuselage, along with a pair of highly capable AN/AAQ-38 FLIR turrets both under the nose and under the port forward fuselage sponson-like structure. Also, a modular Battle Management System (BMS) and advanced communications system, including the latest video and information datalinks, were tied to a series of missionized control stations mounted inside the AC-130W's spacious cargo hold. The Stinger's real sting comes from its ability to lob GBU-176 "Griffin" air-to-ground missiles, or GBU-44 "Viper Strike" munitions off of its rear ramp. This simple but effective rear ramp arsenal configuration is affectionately called "Gunslinger." Ten of the low-yield Griffins or Viper Strikes can be carried in the cradle mounted on the ramp at any given time, although there is room for more to be stowed in the AC-130's hold until needed. Then there are the aircraft's outboard wing pylons. This is where the AC-130W really deviates from its predecessors, it carries AGM-114 Hellfire missiles (like the Marine's KC-130J Harvest Hawk) and guided bombs — the GBU-39 Small Diameter Bomb to be exact. The GBU-39 is really a remarkable and game-changing piece of technology. These 250lb guided bombs are equipped with a spring loaded winged section that snap open when the weapon is released. This allows the slender bomb to glide its way dozens of miles to a target and strike it with incredible accuracy. In fact, a GBU-39 launched by a fighter aircraft at high-subsonic speed and at higher altitude can glide over fifty miles to its target. Hence it is becoming the weapon of choice for destroying Surface to Air Missile sites and small targets deep within enemy territory as it allows the launching aircraft to remain outside of a threatening anti-aircraft system's "engagement ring," and in some cases totally outside of enemy territory as a whole. These pint-sized standoff glide bombs can pack different warheads, from one capable of punching through hardened structures, such as aircraft shelters and bunkers, to a high explosive version that is extremely effective againt soft targets and armor. The GBU-39 is guided via GPS and an onboard Inertial Navigation System (INS), so coordinates can be called up from at JTAC (forward air controller), data-linked from an outside sensor source, acquired via high-resolution synthetic aperture radar, or the AC-130W can "squirt" its laser at a target to get accurate GPS coordinates before uploading them into the weapon and punching it off on its way. The GBU-39 is not cheap, costing over $50,000 each, but they do give the AC-130 community a true standoff attack capability for the first time, which is a good thing seeing as the aircraft, even with its advanced electronic countermeasures, is vulnerable in impermissible airspace, especially to mobile radar guided SAM systems such as the SA-6. Also, the SDB allows a single Stinger gunship to respond to CAS requests in two geographical areas at one time and does not have to orbit right on top of its target in order to have an effect on it. The second-generation GBU-57 SDB II is on the way and it will give the SDB weapon concept exponentially more capability and accuracy that is measured in single foot integers. It will feature a multi-mode seeker and guidance system, with a combined imaging infrared and millimeter radar seeker and guidance provided by both a GPS and a datalink. This means the SDB II can be targeted using millimeter wave radar under terrible weather conditions and can even hit a moving target under those same conditions. It can also home-in on a moving target using imaging infrared, or both modes simultaneously, giving it extreme accuracy, utility, and resistance to countermeasures. Other SDB warheads are also in the works as well, including ones that have a strong blast but very little fragmentation so that they can be used in urban areas with minimal collateral damage while still possessing a high probability of destroying its target completely. In the end the AC-130W may not have the battleship appeal of the bristling AC-130s that came before it, but it does offer a scaleable and cost effective solution to an urgent need, while also paving the way for new technologies that will be featured on the upcoming AC-130J "Ghostrider." Although many traditional gunship fans, including those on the ground that have been awed by their ability to obliterate the enemy with streams of hot death, may be disappointed with the new AC-130J configuration as it is almost identical to that of the AC-130W. The AC-130J "Ghostrider," the first of which has flown recently and is in preliminary testing, will feature the same 30mm cannon, "Gunslinger" rear ramp modification, and the SDB capable wing pylons, along with the command and control interfaces that the AC-130W Stinger uses. There will be no 105mm Howitzer or 40mm Bofors cannon or 25mm gatling gun, and yes, a 105mm artillery shell is way less expensive than a Small Diameter Bomb. The idea is that the AC-130J could be easily modified back into an MC-130 special operations transport and visa-versa. So purpose built, irreversibly modified gunships these are not and both the AC-130W and AC-130J lack the heavy armor of their predecessors, which will enhance their range and operating altitude but hurt in the down-low survivability department. Seeing as these aircraft are more guided bomb chuckers than anything else, this should not be as big of deal as it sounds as altitude will only a bomb or missile's range. 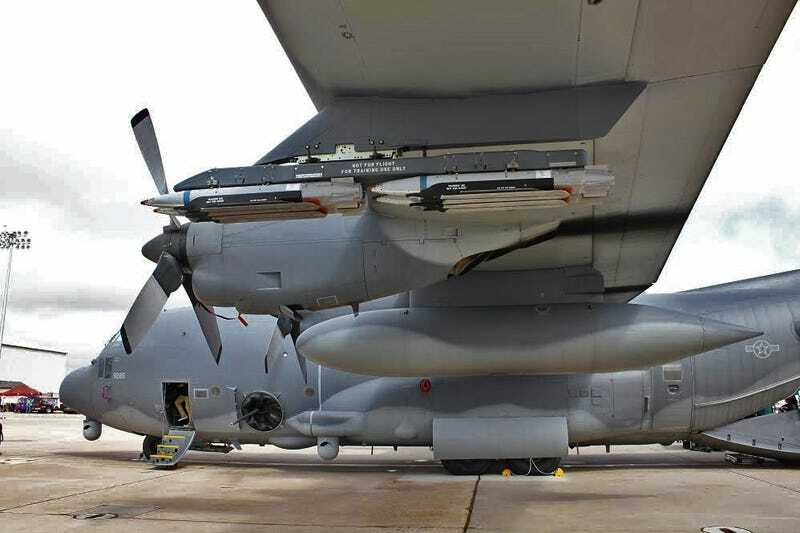 The new AC-130J will have similar sensors to the AC-130W and a high-power synthetic aperture radar pod that can provide live targeting for SDB IIs and its other weaponry will be in its quiver. It will also feature Helmet Mounted Sights for its pilots for enhanced situational awareness. All these systems can also be reverse upgraded into the AC-130W fleet down the line if need be. There has also been some talk of a 105mm cannon or 120mm mortor package for these aircraft, one that possibly mounts in the port side rear door, albeit the possibility of these ever getting fielded is questionable considering AFSOC's clear preference towards guided munitions and higher operating altitudes. Still, AC-130s that are bristling with barrels will be around a lot longer, with the AC-130U fleet having service life still in them. The good thing about these new "bomb truck" AC-130s is that the ability to put up persistent precision fire support over troops in high-risk areas abroad will be enhanced as the fleet of AC-130s will grow to 45 airframes and can be rapidly increased if need be. These include 17 AC-130Us, 12,AC-130Ws and 16 AC-130Js. Still, I think it is time that the USAF change the modern AC-130 moniker from Gunship to Arsenal Ship as the gun part of the equation is becoming a secondary capability over their large magazine of precision guided munitions. A huge thanks to great friend of site Paul Carter for all AC-130W shots. Make sure to check out all of Paul's aviation photography work here. Other photo credits: SDB renderings Raytheon, Test of SDB on hardened shelter and AC-130J shots via USAF, AC-130U underbelly via WikiCommons- Special Ops Guy.